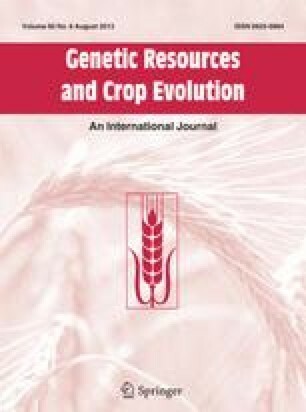 The chloroplast DNA of 96 sweet cherry cultivars (Prunus avium L.) and five cultivars of sour cherry (P. cerasus L.) were analysed to reveal their haplotypes using PCR-RFLP (Polymerase Chain Reaction - Restriction Fragment Length Polymorphism) method. The main advantages of the PCR-RFLP technique are: resolutive, time and cost effective and reproducible. Approximately 9.6% of the chloroplast genome was analysed, using six universal primer pairs and two restriction enzymes. All the mutations detected were insertion-deletions, ranging between 5–30 bp. The combination of all the mutations resulted in three haplotypes (H1, H2 and H3) in the 96 sweet cherry cultivars and a single haplotype (H4) in the five cultivars of sour cherry. The cpDNA polymorphism determined by PCR-RFLP markers helped to understand the maternal inheritance of chloroplast genome in sweet cherry, clearly distinguished the sour from the sweet cherry, and supported that P. avium is not the maternal species of P. cerasus.